A new look England side look to confirm second place in pool A as they take on France. France can still pick Lebanon's pocket and earn themselves a quarterfinal spot, France would have to beat England by a margin of 14 or better to see them into the next round. This will make for a very interesting game as England have had a major reshuffle for this game. Widdop goes to fullback, Percival comes into the centre with Ratchford as his winger and Kevin Brown moves into the six role. England also offer a World Cup debut to Mike McMeeken, who was sensational this year for Castleford, so it will be exciting to see how he does. France name an almost unchanged squad from the side that faced Australia last week, the only changes are Cardace in Arnaud out in the centre and Herald vacates the seven jersey for Lucas Albert. England: England's defence has been far better than their attack so far in the tournament, this will have to be taken care of and quickly, they seem to be out of ideas on the go forward and that will be cause for concern, especially with difficult opponents ahead that are scoring much more points. Jermaine Mcgilvary was found not guilty in his hearing and will start for England, he will definitely be on the French's watch list in this game. Adding McMeeken to the forwards will give England real depth in attack, as he has great pace and footwork for a man of his size. 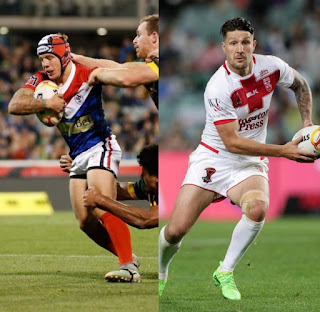 Moving Widdop to fullback could be a good move for England as may be able to add that finishing touch England have missed in previous matches. France: A lot of the French team will be no strangers to the English side, most of the men that will take the field play in Super League. France have stuck with the same forwards for most of the tournament, many of the other teams have rotated their pack in order to rest players, this will have an impact on how they perform as there will be a lot of tired bodies in their forwards. France will look to move the ball to the edges and get their second rowers going man for man at the centres. I can see France attacking England's left edge, where Bateman defends, as that area seems to have been England's achilles heal so far. Conclusion: This game could be a tight one. France have a lot more to lose than England, this is going to lead to a lot of desperate plays, as they need to bag a win a by more than two converted tries to remain in the competition. It's going to be a tough game but I think England have this game by 10 to 20 points.